How to Apply for BSNL JTOs Recruitment 2019: BSNL has begun the registration process for Junior Telecom Officer, JTO posts from 11-02-2019. 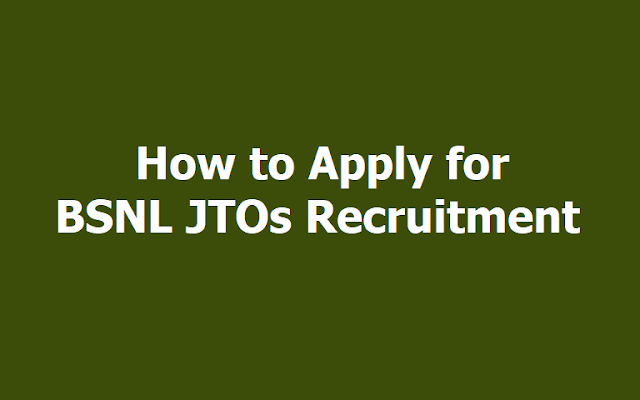 Candidates who want to apply for the post can visit the official site of BSNL at bsnl.co.in and apply for BSNL JTO Recruitment 2019. Bharat Sanchar Nigam Limited, BSNL has begun the registration process for Junior Telecom Officer, JTO posts from today. Candidates who want to apply for the post can visit the official site of BSNL at bsnl.co.in and apply. The recruitment will be made through GATE 2019 score. The last date to apply for 198 JTO posts is till March 12, 2019. Candidates who will be recruited as JTO(Civil) & JTO(Electrical) will fall under IDA pay scale Executive[E-1A] of Rs.16,400/- – Rs.40,500/- as per 2nd PRC with annual increment @ 3% of basic pay plus IDA, HRA, Perks, Medical Benefits, etc. admissible as per BSNL Company rules. Candidates willing to apply for the recruitment drive must have a GATE Registration ID for applying for DR-JTO (Civil) and DR-JTO (Electrical) posts. The application fee is Rs 1000/- if belonging to the OBC category and Rs 500/- if belonging to SC/ST category. Candidates can visit the official site of BSNL to apply. This application/registration is required towards the candidature for the post of JTO (Civil) & JTO (Electrical) in BSNL through GATE 2019 Score. Candidates applying for JTO(Civil) & JTO(Electrical) posts are required to apply online for which link shall be provided through BSNL web site www.bsnl.co.in. The applications will be considered only through the online registration process which is to commence from 11-02-2019 and will be closed on 12-03-2019. Therefore, candidates are advised to visit our web site (www.bsnl.co.in) for any updates regarding recruitment. All candidates applying for JTO (Civil) & JTO (Electrical) posts are required to read all the instructions provided on website www.bsnl.co.in before filling the online application form. The candidate shall be solely responsible for any loss or hardship caused to him due to his non-adherence to these instructions. The candidate is requested to visit BSNL’s website periodically to keep track of new announcements and changes if any. This site is best viewed with screen resolution of 1024x768 pixels or higher, using Mozilla Firefox 16 / Google Chrome 23 or higher. If you have any difficulty in filling the online application form, please send an email to bsnl18@onlineregistrationform.org indicating the problem faced. 1. The crucial date for the application of the Age criterion shall be 12-03-2019. 2. Registration Fee payable is Rs. 500/- for candidates from SC/ST category and Rs. 1000/-for all others. It is non-refundable. 3. Registration Fee shall be paid only online. Please note that fields marked with asterisk (*) are mandatory. 6. After the 'Basic Registration' i.e. after the candidate clicks on 'Submit' button in the Basic Registration Page, system will generate and display the Application Number, which will also be communicated to the candidate by Email and SMS. 7. For subsequent logins, use this system-generated Application Number as 'Login ID' and create new password. 9. On completion of online fee payment, the candidate will be guided to access 'Candidate's Dashboard' from where the submitted application can be downloaded. You are requested to take a print out of the same for future reference. 10. Please note that the Service Charges / Payment Gateway Charges for making the Online Payment Transaction are to be borne by the candidate only. Scanned copy of the passport size photograph. Scanned copy of the signature of the candidate. Scanned copy of UG Degree Certificate. Community Certificate in respect of SC/ST/OBC candidates, if applicable. 12. Candidates need not submit any hard copy of the application to BSNL. The last date for Online Registration is Tuesday 12th March 2019 till 11.59 PM.